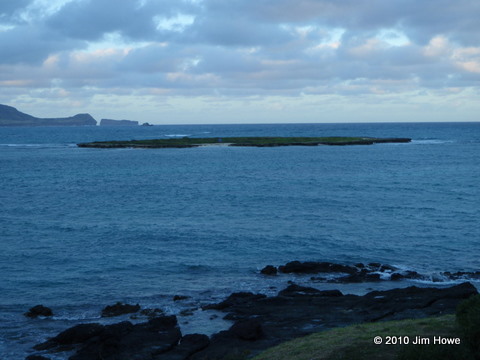 Popoiʻa Island, popularly known as Flat Island, is one quarter of a mile seaward of the boat ramp. Popoiʻa means rotten fish, and may refer to offerings that were left at a former fishing shrine in the middle of the island. The tsunami of 1946 destroyed the remnants of the shrine. Landing is permitted on the island's small sand beach, although Popoiʻa is part of the Hawaiʻi State Seabird Sanctuary. A popular surf site known as Flat Island breaks on a shallow reef on the island's south side.